On Ambient-Mixer.com you have the possibility of creating endlessly looping sound mixes for your personal or professional usage. However, the sound samples and effects used are all part of the public domain and can be used for such a purpose when crediting the original author. Copyright protected material, however, can not be used by our service directly. Yet, there is still a possibility of using movie themes or video game scores for your atmospheres! This short tutorial will show you some ways of including copyrighted material in a legal way. The easiest way for you to add a movie score or similar to your ambient mix would be specifying the link to a video on YouTube, Vimeo, or a similar page that contains the music you want to use in the description of your atmosphere. The link can simply copy and pasted towards the beginning or end of the description and the listeners will have to enter it into a new in their browser to listen to the music you intended to go along with your mix. Unfortunately, the embedding or usage of HTML tags (and thus creating a clickable link) is not possible. 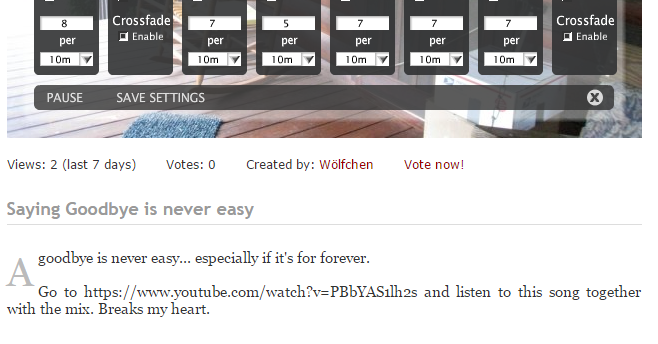 On the individual ambient mixes, you have the possibility to comment using the Disqus comment system. It’s possible to either create an account with Disqus, or you simply log in using your Facebook, Twitter, or Google login data. 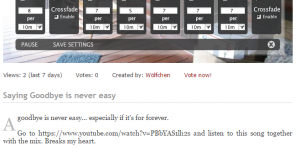 Afterwards, you can comment on your own or other atmospheres. What makes this the best way to include an external video is the embedded YouTube video support of Disqus. 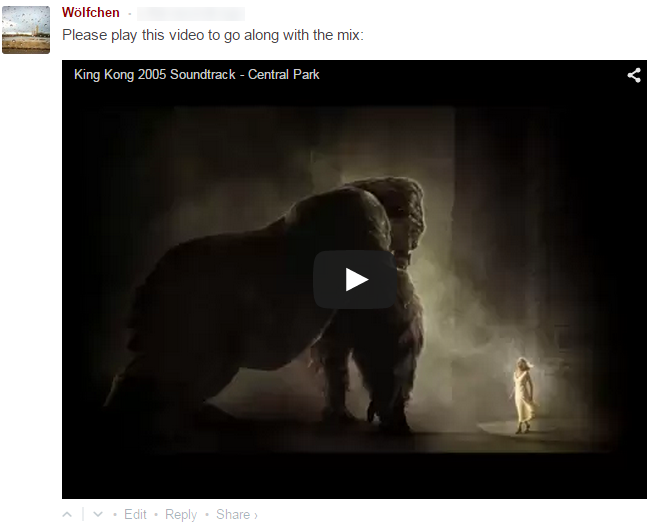 By simply pasting the Link into your comment field, the video is automatically embedded, and listeners do not have to open another tab or leave the page to play the music. Now all you have to do is put a reminder into the description for your listeners to check out the comment section. A video in the comments. Clickable, playing directly from there.